For those who think that the home prices will fall further and are still waiting for that "great deal", take a moment to consider this. 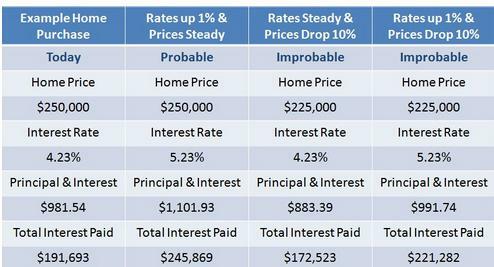 Even a 10 % drop in home prices is nullified by a 1% increase in interest rates. The figure below illustrates this for a home purchase of $250,000. Those who can afford to buy, invest, or move up now will enjoy the opportunity of a lifetime. Literally thousands of dollars can be saved over the lifetime of a typical mortgage loan. Buyers need to understand the positive financial impact of low interest rates! So if you are waiting for prices to fall even lower than they have, you are missing out on the lowest interest rates in years!